We are now almost halfway through November. Kind of shocking, isn’t it? 2011, you have flown by at far too brisk a pace. This week’s mineral is rutile. Rutile is one of those funky minerals that is both useful and pretty, but it is usually at its best when paired with another stone or product. Rutile is one of the natural forms that titanium dioxide (TiO2) takes. 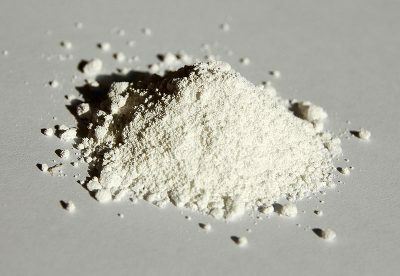 It is mined for use as a plain white pigment, and can be found in paint, toothpaste*, food coloring, sunscreen and as a coating for welding rods. 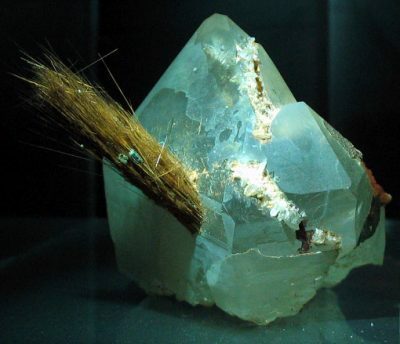 Sierra Leone has one of the largest deposits of rutile in the world, and it is one of their largest exports. Recent reports have suggested that titanium dioxide could be incorporated into buildings’ exteriors as part of the green movement. According to the BBC article, a thin coating of the stuff can interact with UV light, creating free radicals that disrupt common air pollutants like Nitrous Oxide. We’ll see if this method works outside of the lab, but it could be a brand new use for an incredibly important mineral. That same ability to create free radicals that makes it (potentially) a good use in green infrastructure, has created some concern that it’s use in sunscreens could be harmful — with some groups suggesting that it might cause skin cancer rather than prevent it. The Australian government conducted a review of the scientific literature (PDF) in 2009, and found that those fears were unfounded. They concluded that TiO2 is only a danger if it comes in direct contact with viable skin cells while it is exposed to sunlight; and because most of our outer layer of skin is dead, the nanoparticles can’t reach the living cells to damage them. Those are the useful uses of rutile, but it has another, more glamorous side as well. 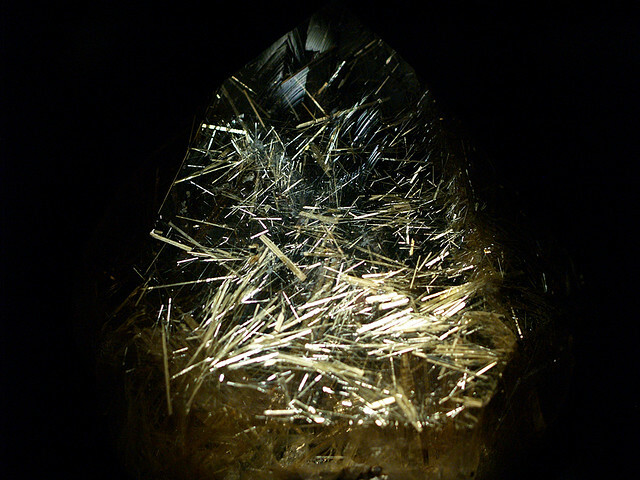 Rutile is found as an inclusion** inside of numerous gemstones, often with beautiful results. This might seem counterintuitive, as people typically want their gemstones to be clear. Rutile is the exception to that rule. When included in rubies or sapphires, rutile can form beautiful star-like images under the surface, shining through the red or blue. 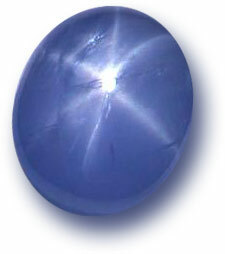 Gems that have a star have to be cut into a cabochon instead of faceted — this means that instead of the typical clear, angular cuts favored for precious gems like diamonds, a gem with a star will be polished to have a smooth round top, like a dome, otherwise the star-like effect is lost entirely. 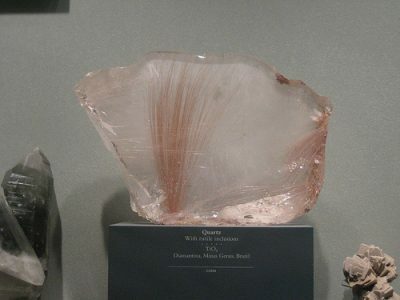 Rutile also frequently shows up in quartz specimens, creating rutilated quartz. 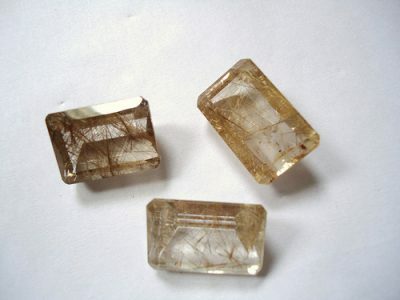 Rutile crystals tend to grow in thin, spindly shapes naturally, and when quartz crystals form around them, the resulting rock is known as rutilated quartz. The rutile inclusions tend to be golden in color, and can grow into beautiful sparkling patterns. I’ll leave you with some pretty pictures — have a great week and see you next Monday!